Following are several tips you should consider before making the next new appliance purchase for your home. Deciding whether you should repair your existing appliance or replace it with a new one generally depends on the cost comparison. A good appliance store should give you an estimate before the repair is done and offer you an honest, experienced recommendation. Should you choose to repair your existing appliance, they should provide you with prompt, expert repair service, have parts inventory stocked on the truck, and complete all repair work in your home. You should establish a budget for the purchase. Keep in mind that appliances range widely in quality and features, directly impacting the price. Be sure to uncover any potentially hidden costs with a new appliance purchase – delivery, installation, removal of existing appliance, cords, supply lines, etc. Shop your locally-owned and operated appliance dealers. 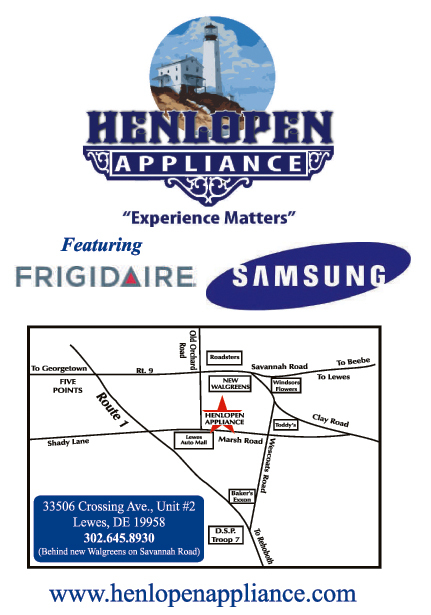 At Henlopen Appliance, our prices are competitive with or lower than the big box stores and department chains. Ask about potential rebates, future sales, volume discounts, package pricing, or price matching possibilities. Another budget-friendly option is to consider purchasing a used appliance. Used appliances can provide you with an opportunity to afford a better quality appliance with more desired features. Be certain that you pick a reputable store to purchase from. Take heed of the space available for each appliance. Measure the available height, width, and depth of the space to be used to house the appliance. Compare the available space to the dimensions of the new appliance. Keep in mind, to ensure optimal refrigerator performance, a bit of extra space allowance at the top is recommended for proper air circulation. Consider the operation of the appliance and how that will affect the surrounding space. Are there possible obstructions to fully opening a refrigerator door or a top-load washer lid? Are you switching from electric to gas, from a range hood to an over-the-range microwave, from no ice maker to an ice maker? Note what additional power supply and plumbing modifications will be necessary to install and operate your new appliance. Appliance features fall into two categories: Needs and Wants. Depending on your household, there are features that you may need an appliance to have to simply maintain your day-to-day living, such as a refrigerator with an ice & water dispenser, a range with a self-cleaning oven, or a dishwasher with a delay start . Depending on your budget, there are features you may want an appliance to have to provide you with additional functionality and convenience, such as a range with convection cooking, a laundry pair with steam options, or a four-door refrigerator with an LCD digital display with apps for Twitter, Pandora, WeatherBug, and more. By choosing to purchase your next new appliance from Henlopen Appliance, a local, independent appliance dealer, you are choosing to get more for your money. Your purchasing experience will include personal attention and professional service, but our involvement doesn’t end with the sale. Henlopen Appliance provides complete delivery and installation services, as well as removal of your existing appliance. Henlopen Appliance also carries a variety of gently used, completely refurbished appliances at deeply discounted prices. In addition, we will be there to respond to your appliance repair needs with expertise that spans almost eighteen years. Henlopen Appliance believes that Experience Matters. We know you believe the same. We know appliances. That’s all we do. For help with your next new appliance purchase or for more information, call 302.645.8930. When I decided to buy a used refrigerator for my garage I went to a used furniture store. The refrigerator looked great; actually it looked almost brand new. The man selling it said that it was slightly used and had been traded in because they decided to go stainless. Good story, right? Well it was all lies the unit had a bad compressor. Of course I didn’t know this and paid him $500.00 for a refrigerator that would cost me $700.00 to repair. Moral of the story go a good local store owner that you can trust if buying used. I purchased a new refrigerator from Henlopen, which they delivered to my home, gave me the ice maker, took away the piece of junk, and all at a better price than any of the large appliance stores. I would highly recommend this family owned business for all your appliance needs.